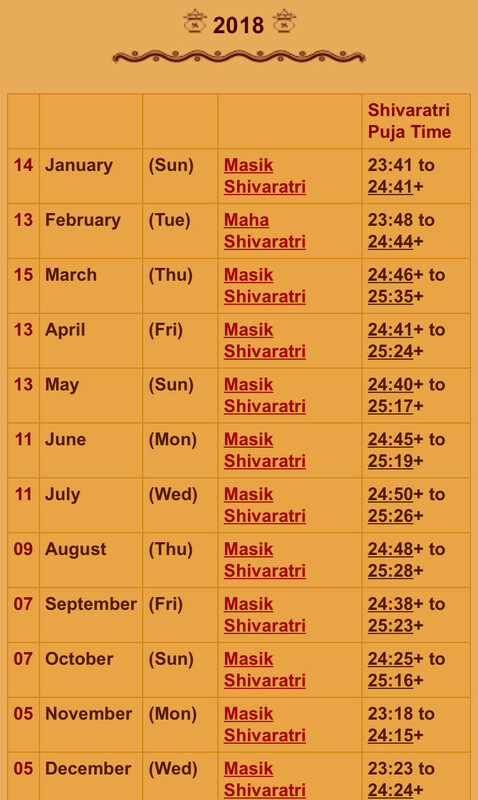 I found the following date calendar for Masik Shivratri, till date I was only aware of Shivratri and Maha Shivratri but Masik Shivratri is totally new for me. So wanted to understand the importance and concept of Masik Shivratri plus would like to read any references/stories from scriptures or other authentic sources. A description and importance of monthly Shivaratri and its significance is provided in Skanda Purana - Book 1 - Maheshwarkanda - Section 1 - Kedarkanda - Chapter 33 - Greatness Of Shiva Ratri Vrata. The Skanda purana is also describing other Shivaratri's like Nitya Shivaratri , Magha Shivaratri and Maha Shivaratri . According to Skanda purana monthly Shivaratri or Masa Shivaratri is observed every month on the Chaturdasi (14th day) of the Krishna Paksha . 82-83 The fourteenth day is favourite of Shambhu. There is no doubt about it. The Chaturdashi of the dark half which extends to the mid-night is a Tithi (Lunar Day) on which one should observe fast.It is very excellent and is conductive to the attain-ment of Sayujya (identity) with Shiva. The tithi shivaratri is well known as the destroyer of all sins. So by observing monthly Shivaratri vrata a devotee attains Sayujya mukit with Lord Shiva and all his sins get destroyed. This Skanda purana is chapter is also giving us the list of what tithi (lunar day) is specially favourite of which deity. And the 14th day of every month is favourite of Lord Shiva so on this day the Shivaratri Vrata is to observed. There is a story of certain Chandala becoming king in his next birth attaining Sayujya moksha with Lord Shiva and obtaining spiritual knowledge. Brief Story - There was a certain Brahmana widow of flicle mind ,who was in love with a chandala. A son of evil mind was born to them . He became a evil hunter , thief , addicted of liquor and a gambler. Once he happened to go to temple of Shiva on monthly Shivaratri night , and then he stayed there for many years listening the holy scriptures and in the presence of Lord Shiva. In the next birth he became the son of Chitrangada with the characteristics of a great king known as Vichitravirya. He also by the grace of Shambhu and observing monthly Shivaratri vrata by mere his presence obtained great spiritual knowledge and finally got Sayujya moksha with Shiva. Not the answer you're looking for? Browse other questions tagged shiva worship festivals . What is the importance of Dhanteras? What is the importance of celebrating temple festivals every year? What is the importance of Tilak and Chandlo in Swaminarayan Religion? What scriptures describe Sadashiva carrying Vishnu in Vishnu's abode of Paramapadam? Which one of these two mantras is more powerful?